It was late afternoon when we motored from Shelter Bay Marina to the staging area in Bahia de Limon to await our pilot and extra line-handler. The past two days was a much needed rest after having just sailed over 1,700 miles from the Bahamas, around the western point of Cuba and due south across the Caribbean Sea. It wasn’t a lazy, sit by the pool with a frufy drink kind of rest. Rather it was a change from the ten days of being at sea where a constant watch is kept to ensure there is still wind in the sails, the course is maintained, the crew is rested and fed and collisions of any sort (with other vessels, drift wood, large containers or even land) are avoided. The owner of the 65-foot French built catamaran sailboat and his young son flew in to join us (a delivery crew of four) to experience the passage of his vessel through the Panama Canal. Oceanic transits need not be particularly messy, and our trip was benign and beautiful by trans-oceanic standards. But even $2.5 million luxury sailing yachts like this one turn very utilitarian while underway. So, a much needed clean-up job was in order before the arrival of the owner to restore the boat to its in-harbor, four-star hotel, luxury status. This was our rest. Once poised to enter the canal, a pilot was assigned and came aboard to help us navigate Gatun Locks, our first segment of the Canal transit. The sun set behind graying skies as we motored up behind a cargo ship that spanned the width of the chamber to the first set of locks, which were built over 100 years ago. The concept of a canal connecting the Atlantic and Pacific oceans belongs to a Spanish explorer by the name of Vasco Nunez de Balboa (1475-1519). In 1513 Balboa was the first European to see the Pacific from the shores of America. He took a major shortcut compared to what Louis and Clark would endure to get to the American Pacific coast hundreds of years later in 1803. It wasn’t until the late 1800’s after the French had built the Suez Canal that an ernest effort was made to cut a trough through Central America. Sadly, the French were determined to build a sea-level canal like the Suez. A canal that was essentially a river from one ocean to the other. No locks, just a thin ribbon of unencumbered water without any complicated machinery to pass through. This cost the French 10 years of expensive misery and 20,000 lives of mostly Caribbean slaves. They never got it to work. With the help and vision of an entrepreneurial member of the French attempt, Phillipe Bunau-Varilla (1859-1940), the Panama Canal opportunity came to the Americans who were already entertaining a number of canal concepts, including one through Nicaragua. With heavy American influence, Panama declared independence from Columbia and sold the rights to build the canal to the Americans for $10 million (not a bad chunk of change for a new nation). After another decade, the Americans, with the willingness to dam a river, flood out a couple dozen native villages, form a lake, build locks (fed by the reservoir of the lake) and dig a canal through the continental divide, emerged with a successful project. The completion of the canal eliminated over 9,000 miles of sailing around the southern tip of South America giving the US Navy, approved allies and merchants a solid maritime advantage. We slowly motored into the first set of locks. There was still some light in the air, but it was dark deep in the chamber. Dark slimy walls would glisten, ever so subtly and the darkening sky was limited to a small rectangular horizon above us. We were sharing this part of the voyage with a small cargo ship. Small is a relative term. He still took up the whole width of the locks, but was not the full length. We were only a few dozen feet behind him when the massive ribbed metal doors closed behind us and the calm waters we had floated in on started to gurgle below us. The incoming water is piped through a series of pipes under the chamber to ensure an even fill and to minimize turbulence so boats don’t go swinging into the slimy concrete walls. Things still move around quite a bit and those of us who were line handlers had to stay vigilant as the incoming water swelled up from the floor and burst in bulbous watery mounds through the crisp calm surface. Our lines were attached at the top of the locks and as the water level rose below us, we ate up the slack line. Slowly getting closer and closer to the top as the sky got darker and darker. The clouds, now in their last phase of dark blue before the black of night took over, loomed over us as we unhitched from the first chamber of locks and motored in the second of three. We were now 85 feet above the Caribbean Sea and we had another 170 feet to go before we were in the fresh waters of Gatun Lake. The very waters that buoy us up and up and up. That night we anchored just around the corner from the locks. Our pilot got picked up in the dark and a new pilot met us at 6 o’clock the next morning. The sun was just starting to rise as we motored away from our anchorage. Edwin, our new pilot, took us through the Banana Canal, which is a small corridor for smaller boats like ours that winds through the islands of Gatun Lake and provides a close look in the colorful morning light at the unique shorelines created by man by flooding the Charges river just one hundred years ago. Many of these lush islands are now used as recreational camping grounds for family vacations. After motoring across the 20+ miles of Gatun Lake we entered the actual canal, the portion that had to be dug out. The sun was now high and yellow and hot. The clear blue waters of the Caribbean were long gone. Though Gatun Lake was fairly clean looking, the constant work being done on the sides of the canal to make it wider and deeper made the narrow channel a cloudy grey-green mess. Slowly, the lush shores of the lake narrowed in on us while the slopes got steeper and browner. Huge cargo ships going the opposite direction became more frequent and as we rounded one particular corner, Centennial Bridge with tall twin towers fanning support cables came into view. We were about to float across the Continental Divide. This is an audacious concept for North and South Americans alike. For most, the Continental Divide consists of either the 14,000+ foot Rocky Mountains or the 20,000+ foot Andes Mountains. The thought of a 65-foot catamaran sail boat in either of these environments boggles the mind. But here in Panama these great mountain ranges kneel down nearly to sea level on an isthmus so thin and geographically fragile that man could carve an 800-foot wide canal right through to join the Atlantic to the Pacific. As we floated under the bridge and across the Divide, I marveled in my thought at the great mountains to the north and the south and in the humid heat of Panama, I dreamed of the cool mountain breezes those mountains offered. In less than a mile and a half past the bridge, we began our descent into the Pacific. 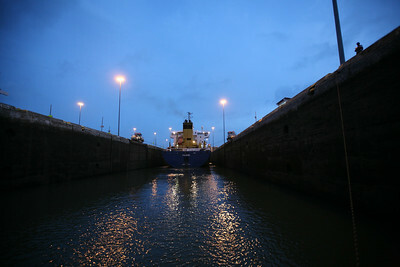 The Miguel-Pedro Lock, our first step down led to the most commonly visited section of the canal, the Miraflores Locks. This is where most people who visit Panama see the canal and watch boats rise and fall in the locks below them from the tourist viewing platform. This time, we started flush with the rounded lip of the concrete lock chambers, our bow and stern lines shooting straight out from the deck of the boat to the shore. Without the turbulent drama associated with filling the locks we slowly sink and the walls rise up around us. Part way down, a crack in the worn slimy green wall is exposed and the main chamber water level drops faster than it can drain. A waterfall is formed and the gushing water is the only sound we hear echoing in our hallow chamber. The gigantic car carrier in the chamber next to us first becomes bigger then nearly disappears behind the false rising horizon all around us. A buzzer sounds, the solid metal doors before us slowly inch open, the bow and stern lines are released and fall into the water next to us and we enter the Pacific Ocean. Sadly, I never got away from the marina. Our cook went into town to by groceries, but that was about it. I did get to check out Panama City some however. That was very neat to see. Did you get to poke around much on shore while you were cleaning up the yacht? I would be interested to hear what Colon is like 5 years later. I spent over a week in the Canal zone and only once came within sight of the canal, at night, but I did get to eat alot of bad Chinese food. The sailing passage sounds breathtaking. Nice video footage, too.